On a computer that has storage pools or storage spaces created, the storage pools is set to read-only and the virtual disks does not attach automatically if you reinstall the operating system. Likewise, if you remove the physical disks which are used to create the storage space, and bring the disks to another computer, the same symptom will happen, i.e. storage pool is offline and no virtual disks are attached. 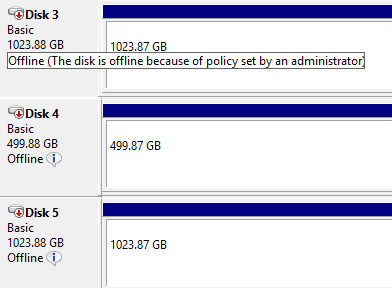 In Disk Management, the virtual disks show that “the disk is offline because of policy set by an administrator”. 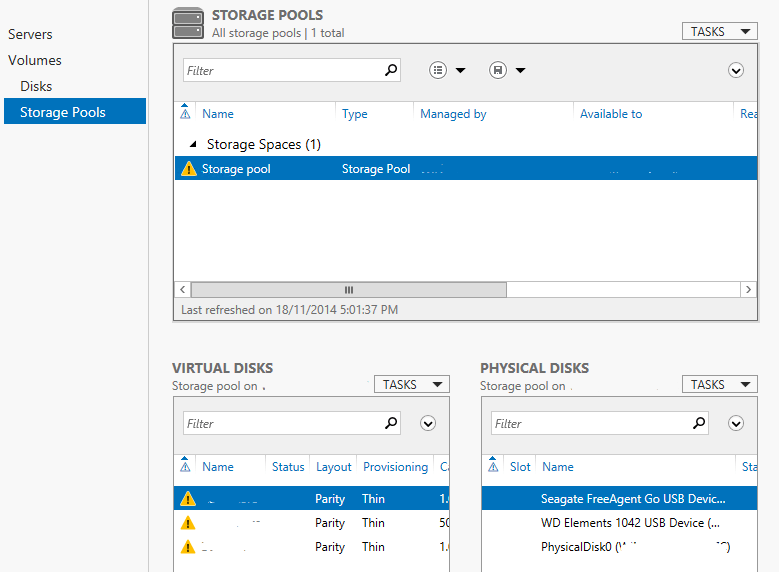 On Windows Server’s Storage Pools area of Server Manager, the health status of the storage spaces and virtual disks is shown as “Unknown”. To resolve the issue, open a Windows PowerShell window as Administrator, and run the following commands. You can also run the Get-StoragePool -FriendlyName “Name of Storage Pool“ command (replacing Name of Storage Pool with the actual name of the storage pool) to check a specific storage space if you know the name. Storage Spaces feature is available since Windows 8 and Windows Server 2012, and Windows 8.1, Windows 10, Windows Server 2012 R2 and Windows Server 2016 continue to support Storage Spaces feature.